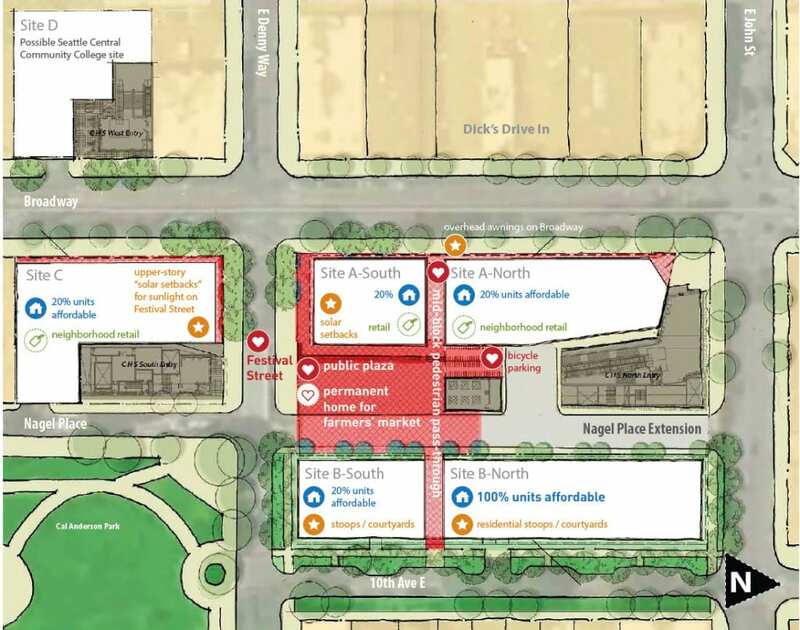 Sound Transit has selected eight firms to submit bids to develop four housing and retail properties that will surround the future Capitol Hill light rail station. The shortlisted firms will also sit down with the Capitol Hill Champion group at a June 2nd public meeting to make sure they understand and adopt the community priorities forged over several years. Fourteen companies and nonprofits originally responded to Sound Transit’s February request for qualifications to develop 100,000 square feet of “transit oriented development” that will include housing, retail, and community space stretching along Broadway from John to Denny. Sound Transit will release a request for proposals for each site in June. Developers will then have until September to submit their plans. Sound Transit hopes to have developers selected by this fall. Four of the developers are applying to be named a “master developer” for the project, which includes an all-affordable housing property. Capitol Hill Housing applied to be both a single parcel developer of the affordable housing site and a master developer through a partnership with New York-based firm Jonathan Rose Co. Meanwhile, developers like The Wolff Company are already very active in the area with its about to open Sunset Electric project at 11th and Pine and Pike Motorworks development at Pike and Harvard. Capitol Hill Housing & Jonathan Rose Co.
Firms that were winnowed in this latest update to the process include Westbank Projects Corp, CenterCal Properties, Emerald Bay Equity, Lake Union Partners, and TOD Housing LLC. Capitol Hill Station is slated to open for service on a new line of the Sound Transit light rail connecting downtown to UW via Broadway in early 2016. While it’s very unlikely the entire development site will be ready by then, officials expect to have Site A complete. A minimum of 397 apartments could be built on the sites, with at least 36 percent reserved for below market-rate affordable housing. The new developments will also feature ground-level retail and a public plaza which could be the home for the Broadway Farmer’s Market. Bellwether Housing and Capitol Hill Housing are each short-listed for site B-North only – there are also three master developer teams short-listed for that site. CHH is part of the Jonathan Rose team, Bellwether is part of the Gerding Edlen team, and MacFarlane from San Francisco has partnered with Bridge Housing out of the Bay area as their non-profit affordable housing developer partner. Bridge apparently didn’t make a separate submission on Site B-North only. Monday night, CHH and Bellwether will each be presenting, as will Jonathan Rose and Gerding Edlen and MacFarlane, and all the other teams – so no, CHH isn’t presenting twice. Sound Transit is offering each parcel separately. I find the attached document the clearest statement of who wants to propose on what. It’s a complicated dance card. This entry was posted in News, etc. and tagged broadway, development, transit by Bryan Cohen. Bookmark the permalink. I think it’s great that there will be lots of affordable housing in this development….4 of the 5 buildings will have 20% affordable, and one will have 100%. I hope those who are always whining about the lack of affordable housing on Capitol Hill will take note. Yes, it’s a few years away, but it will happen.